Laguna Football Club was founded 2/9/96. 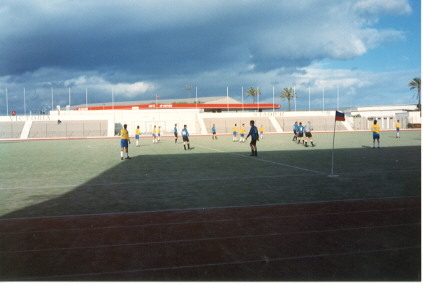 At the beginning of 1996 a group of lads used to gather at the Victoria Stadium to play some football, mainly all from Laguna Estate. 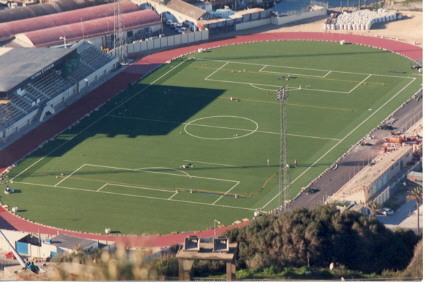 It was then when Luis Pitto and myself Kevin Bugeja started to see the enthusiasm that the lads had towards the game, so we proposed to form a club to play competitive football, and join the Gibraltar Football Association. We then had the challenge of raising enough money to pay the G.F.A fees and to buy a football kit. Jeff Pitto found a sponsor which was willing to buy for us 2 complete football kits and print our badge and its name on the shirts. Thanks to The Sir Winston's Tavern we started to get the club going. Then with a little raffle and some money we ourselves put, paid the G.F.A fees and entered the 4th Division for the season 96/97. We started of with 16 players of which 2 still play for the club, and Luis Pitto and myself have taken more of a managerial job. Today we have a full squad of 22 players and more willing to join. In total 93 players have passed through the club in its 9 years of existance. (see Statistics page). Season 96/97 We started the season excellently, winning our first game(8/10/96) 3-0 against Westside S.C, a new team to the league like ourselves. 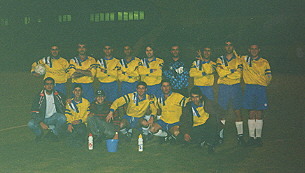 The next match (3/11/96) we met the more experienced side of Glacis Ath and we suffered our worst defeat to date(7-0). 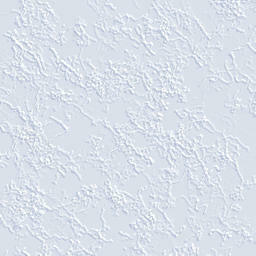 (see Statistics page). We won our next match(7/11/96) 2-0 to Liverpool S.C.
2 shots from that game against Liverpool S.C.
On the left, M.Hill and E.Clinton in attack. 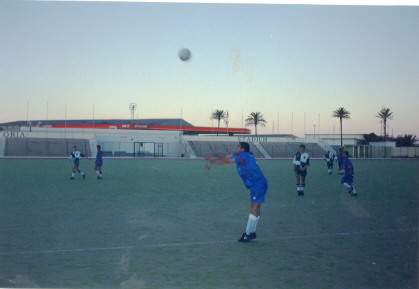 On the right, J.Pitto(capt) executing a throw-in. We then lost our next 4 games(Eurolynx, Pegasus Ath, Lyonnaise, Gib County), and drew our last game of the first round to Calpe Milan. For the start of the second round matches of the league, we had signed up some more experienced players and managed to win 4 games, draw 2 and lose only 2 games, helping us to finish in sixth position with the same points but less goal difference to fifth placed Gib County. 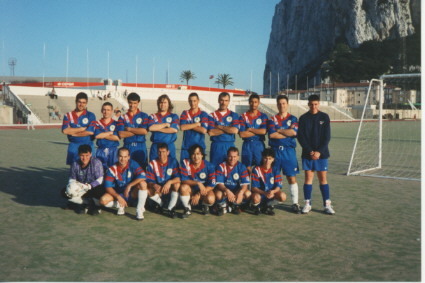 Season 97/98 The Gibraltar Football Association promoted 6 teams from the 4th division to the 3rd, due to other teams in the higher divisions leaving the league, and some new teams joining the 4th division. 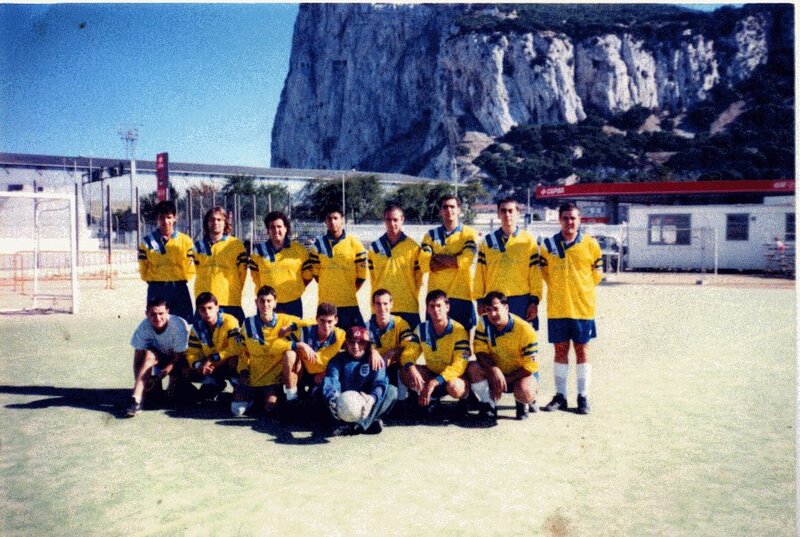 So in our second year of existence, we played in the Gibraltar Football Association 3rd Division. For this season we managed to pay the G.F.A fees without the help of any sponsor. Six players left and five new players were recruited for the beginning of the season. Season which we started excellently winning our first 2 matches against Lions Res and St Theresas Res, (the latter would go on to win the league with just 2 defeats). For the next game we could only field 10 players(some players due to work commitments and others to injuries) and we lost it to Calpe Milan, but the next game(2/12/97) we beat Gib County by 8 goals to 1 being this our biggest win to date(see Statistics page). 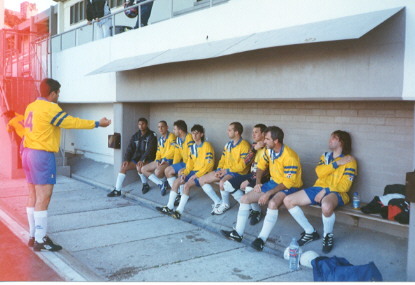 On the left, J.Pitto(captain) giving instructions at half time. 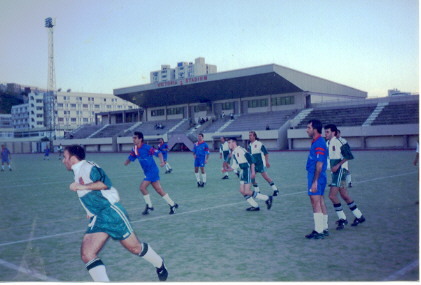 On the right, Action from this game. Our next match was after the Christmas period and it was for the Gibraltar Football Association Cup again against Gib County. It was one of the best games that both teams have played this season, ending with Laguna F.C winning by 3-2, third goal scored in the last minute of the game. Then we faced Calpe Milan for the 3rd Division Cup, another memorable game in which we were 2 goals down at the end of the first half, but by the 30th minute of the second half had managed to bounce back and were leading by 3-2, only to be drawn in the last minute of the game. As it was a Cup game penalties had to be taken of which we missed 3 and they only missed 1. We were defeated in the 2nd round of the G.F.A Cup by College Cosmos a team of under 18's which had entered the 4th division this year, and had a very well organized and disciplined team. From then on we only had the league to contend with, and we continued to try to at least maintain ourselves in the 3rd division for the next year. By the end of the season we had reached our objective ending 5th in the league just 6 points(2 matches) behind the 2nd placed team.